Athlone and Garrycastle native Martin Ward is gearing up to compete in the K1 World Championships in Italy next month. 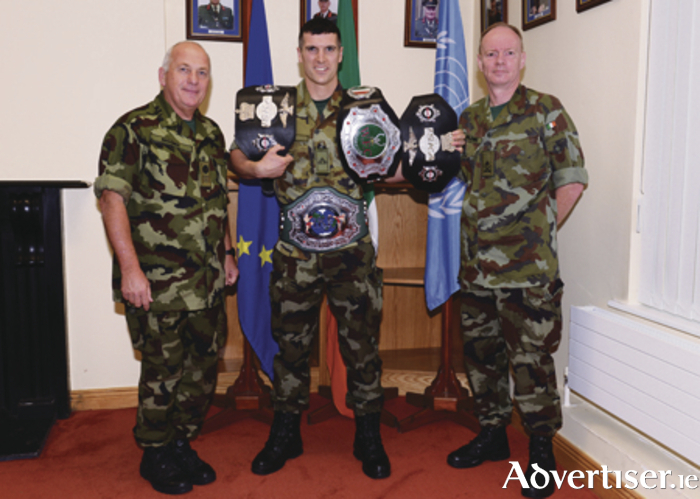 Martin will be looking to add to his collection of titles, with four K1 Irish titles, one World Championship silver medal, and an All-Army boxing title already in the bag. Martin has competed in martial arts since the young age of six after being inspired to do so by his late father, Cpl Peter Ward. His father was also one of the chief inspirations behind Martin's decision to embark on a career in the Defence Forces. Tragically, Cpl Peter Ward lost his life in 1992 while serving in the Lebanon. Martin was just six years old at the time. In all the years that have passed, Martin says that this year in particular has been one of the more emotional ones due to the fact that he is now 29, the same age as his father was when he passed away. Martin's life is one of dedication. As well as serving in the Army barracks in Athlone, he is currently training twice a day, five days a week for his upcoming bout. While the schedule is demanding, he would not have it any other way in order to be fully prepared to take part in the sport he loves. "Of all the sports I do, martial arts is the most competitive," he said. "You are on your own in there, you know; you are an individual and you can't have an off-day. A player on a team having an off-day isn't picked up on as much, but if you have one competing in martial arts you are in trouble. So you dedicate yourself in training with strength work, cardio, diet and all of those things, and I really enjoy every bit of it." Martin is stationed in Custume Barracks Athlone with 'A' Company and is quick to commend the Army for the manner in which it has supported him and prepared him for the sporting challenges he faces. He speaks with great pride regarding his family's long history of involvement in the Defence Forces and about what it means to him to pull on the Irish colours when representing his country through both his job and his sport. "I've always had the dedication in terms of training but joining the Army has certainly been a big advantage to me," he said. "It gives me far more time to train than another job would. I was a carpenter before this and it was far more difficult in that respect. So the Army has been great in that way. It's a brilliant job. My CS in 'A' Company and Barrack OC are always very supportive of me, which really helps. "I am very proud of my family's history in the Army, and of wearing the Irish uniform. My family has a long history of service, going back to my grandad, John O'Brien, who served for 46 years in the Defence Forces, and I have a lot of uncles and cousins who have served and are still serving. I also take pride in my martial arts achievements." Speaking about the upcoming championships, Martin is determined to go one place better than he did last time out: "I am confident going over," he said. "I was over at the World Championships in Spain last year and I won a silver medal. I was only about 60 per cent fit at the time, so this year I am looking forward to going to Italy and hopefully I can bring home the gold."